Kentucky – Once frontier land and originally part of Virginia, this “Commonwealth” central-southern state is well-known for its fertile soil, horses and bourbon. With a population of around 4.4million in 2017, this is the 26th most populous state of the Union. Kentucky’s economy traditionally was based largely upon agriculture including horse breeding - a sector that remains highly important today. New industries have sprung up including that of truck and automobile assembly, where the state ranks 4th in the US. However, coal mining has declined very significantly (a 50% reduction during the period 2011-15) causing some social and economic hardship. By some estimates, the state’s debt is now the 5th highest in the US. At just over $48,300, Kentucky’s household income average is below the US national average. The same is true for individual income at $26,779. 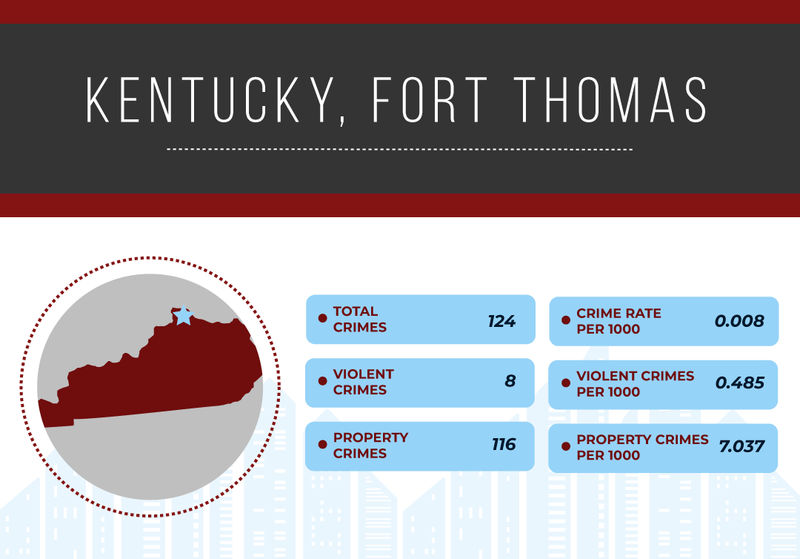 It has a violent crime rate that is considerably below (nearly half) the national average (0.61 ratio) with 2.11 crimes per 1,000 against the national average of 3.47. Examined alongside national averages, property crime levels are also low at a ratio of 0.71 based upon 28.77 crimes per 1,000 which compares favorably to the national average of 40.43. 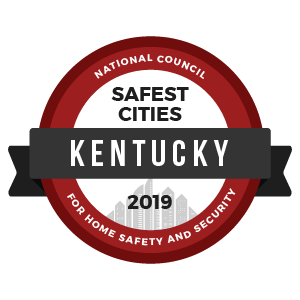 To identify the safest cities in Kentucky, we reviewed the most recent FBI Uniform Crime Report statistics. A total of 7,639 cities were factored into this ranking with populations ranging from 7,639 to 4,007,147. However, we eliminated any cities that failed to submit a complete crime report to the FBI and removed cities with populations under 10,000.